I'm making scones today for a women's tea deal at church this afternoon. I already have a post with the full-sized version of these, but I thought it would be more fun to give them a post all their own since there's a little more to the process, and you bake them at a higher temperature. 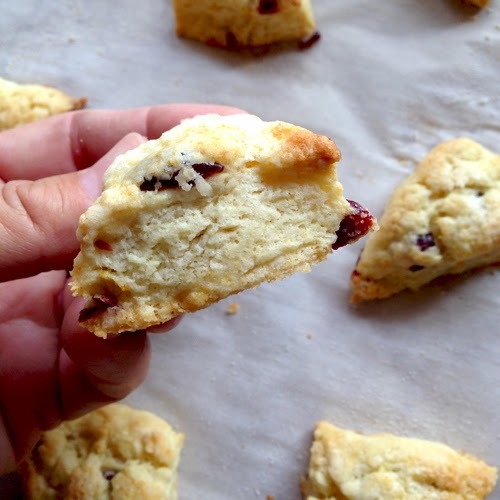 It's taken me a couple of years to realize this, but when you're making a smaller version of a scone like this, it's better to bake it faster at a higher temperature so that they don't dry out. These came out perfectly browned and crisp on the outside, moist and tender on the inside. 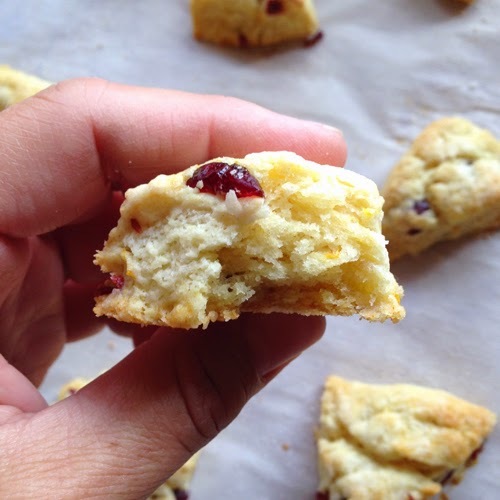 Just the way I like my cranberry orange scones. They have a definite orange flavor, thanks to both the orange zest and the orange extract; and they are buttery, sweet and fluffy. Mmm. I'm so glad my friend Sherri asked me to bring something today. These scones are perfect for taking to group events where there will be other baked goods to choose from. They're big enough to enjoy all the flavor--about four or five bites, but they're small enough that people will be able to sample other small goodies as well. Sift flour, sugar, baking powder, salt and baking soda into large bowl. (By "sift" I mean put the ingredients in a large bowl and stir well with a whisk.) Mix in orange peel. Add butter and rub in with fingertips, or cut in with a pastry blender, until mixture resembles coarse meal. Mix in dried cranberries. Measure half & half into glass measuring cup and add orange extract. Add half & half, tossing with fork until moist clumps form. Turn dough out onto lightly floured work surface. Knead briefly to bind dough, about 4 turns. Cut ball of dough in half. Form dough into 2 1-inch-thick rounds. Cut into 6 wedges each. Then cut each of those wedges into four wedges (sorry I didn't take a pic of this process--but you can see it at the bottom of my Mini Cake Mix Scones post). Transfer wedges to prepared baking sheets, spacing 1 1/2 inches apart. You should be able to fit 16 on each sheet. Place two sheets in the refrigerator while you work with the first. Brush tops of scones with a little half and half and sprinkle with sugar, if desired. 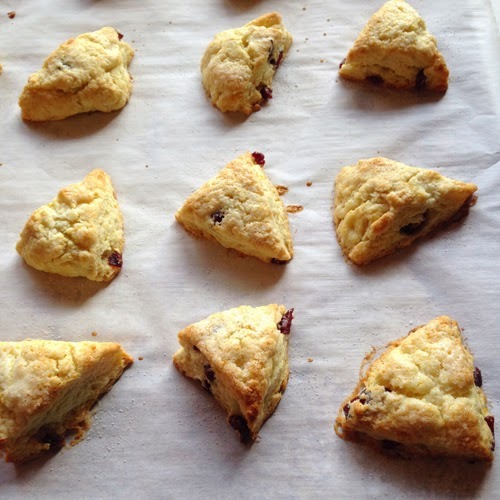 Bake at 400°F until tops of scones are golden brown, about 10-12 minutes. Let stand on baking sheet 10 minutes. 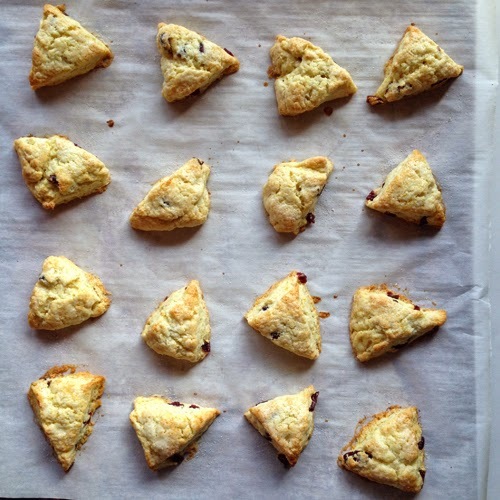 Serve scones warm or at room temperature. Note: If you are not baking for a crowd, you can freeze these and enjoy one or two at a time for a while. 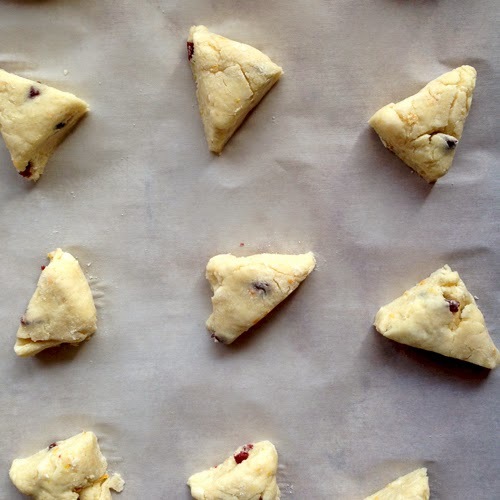 Place cooled scones on a parchment or wax paper lined baking sheet and place in the freezer for a couple of hours. When they are frozen solid, place in a zip top freezer bag. Reheat them at about 325 degrees Fahrenheit, wrapped loosely in aluminum foil, for about 10-15 minutes. Alternately, I've seen that Martha Stewart will freeze the unbaked scones. Click here and see how Martha does it. I have not tried that, but I trust Martha that it works. I don't follow many people, but love your info and comments, along with many of the recipes you have found...I don't know how to put my own recipes on, so I just copy others...will have to get more savvy on posting and start my own blog!! Thanks for sharing all your great ideas, info and recipes! Aw, thanks. :) I'm glad you're enjoying some of the recipes here.